Barbara Andrews is trying to get her life back together after her divorce while planning her daughter’s wedding. Even with everything she has on her plate she hasn’t been able to forget the man who had entered her life at a very difficult time and had shown her kindness. And when Detective Rick Blair asks her out, she is not sure if she’s ready to put the past behind her and move on, although she can’t deny the attraction between them. Rick intends to prove that she is definitely a woman who is ready for love. Peggy Morrison has finally gotten her life together and is happily involved with a man who knows how to treat her like the desired and passionate woman that she is. And when Willie Baker asks her to accompany him to Paris, she has to decide just how far their relationship has come and even importantly, how far she wants it to go. Willie is determined to be the one to teach Peggy a thing or two about love the second time around. Cathy Bristol has been in love with her boss for what seems like forever, and decides it’s time to take matters into her own hands. She gets the chance to do so on a business trip they take together. While Orin Jeffries focuses on business, Cathy focuses on trying to show Orin that she’s the woman for him and is determined to make the emotionally scarred divorced Orin see her for the woman that she is. A woman intent on conquering his heart. When Corey Westmoreland runs into the one woman he let get away over thirty years ago, he is determined to keep Abby Winters within his reach. Even if it means taking her up to his mountain. And once he realizes their attraction is still explosive after all this time, he’s determined to convince her that it’s not too late for them and that their past and present have now collided for a reason. It was always meant for Corey’s Mountain to be their home. 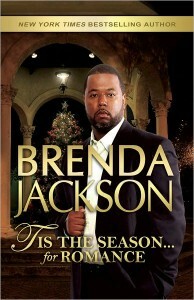 Tis The Season…for Romance is a “must have” book for every Brenda Jackson reader keeping up with the various families she has created. The hero and heroines in these stories were requested most by Brenda’s readers….Okay, Joshua Avery headed the list, but we won’t tell his story just yet!